Last week, Roger posted an interesting question about Jesus. He said, "Why is it we celebrate his birth and then nothing is said or written about him until he is an adult? Or did I miss something along the way?" I've had similar thoughts from time-to-time and so have other people over the years, so I figured I'd share what I know. There are really three questions Roger is asking. The first is, why do we celebrate his birth? This is a good question. Early Christians didn't celebrate his birth, they celebrated his resurrection from the dead. Certainly the early Jews did not celebrate birthdays (and their lunisolar calendar makes it difficult to do so anyway with leap months and all). The early Christians didn't celebrate the birth dates of saints, preferring instead their death dates, so since virtually no one was celebrating birthdays, it makes sense that the calendar date of Jesus' birth wasn't recorded. We do know from the Bible that he probably wasn't born December 25. It's recorded that shepherds were keeping watch over their sheep at night, which in Israel it's too cold to do most Decembers. Using other markers like the birth of John the Baptist, the Roman census, etc., it's probably safe to assume that Jesus was born during the months of August to September. So why December 25? Well, the pagans had their feast day of Saturnalia that day and the Roman Catholic church wanted to put a stop to it, so they kind of party crashed Saturnalia and in the year 440 proclaimed the birth of Jesus to be the same day. 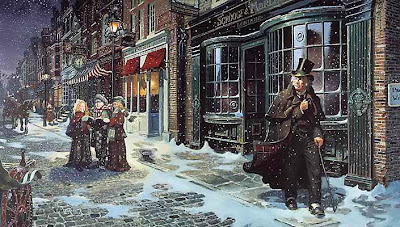 Many dissenting Christians (e.g., Protestants including Puritans) resented all the trappings and excesses, so they tended to shun the holiday. In fact in parts of Colonial America it was against the law to celebrate the day as it had been earlier in Cromwell's England. George Washington knew that the Hessian soldiers would most likely be drunk on Christmas, so he chose that day for a surprise attack (and to most American soldiers it was just another day). 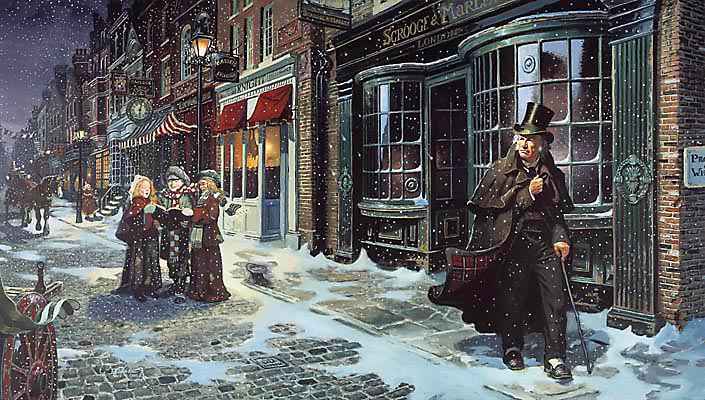 Christmas got a big boost from Dicken's Christmas Carol and along with immigration from Europe, Americans began celebrating Christmas in larger numbers during the 1850s. The answer to why we celebrate his birth and why we do it the way we do is probably just tradition of a modern origin. Roger's second question (which was really combined with the first), which I'll paraphrase, was, why is nothing said of Jesus between the time he was born and the time he was an adult? Actually, there are a couple of little snapshots of his life growing up if you look closely. We know his family was from the town of Nazareth (in Northern Israel). Joseph and Mary had to travel to Bethlehem (closer to Jerusalem) for a Roman census and when they got there Mary gave birth to Jesus. 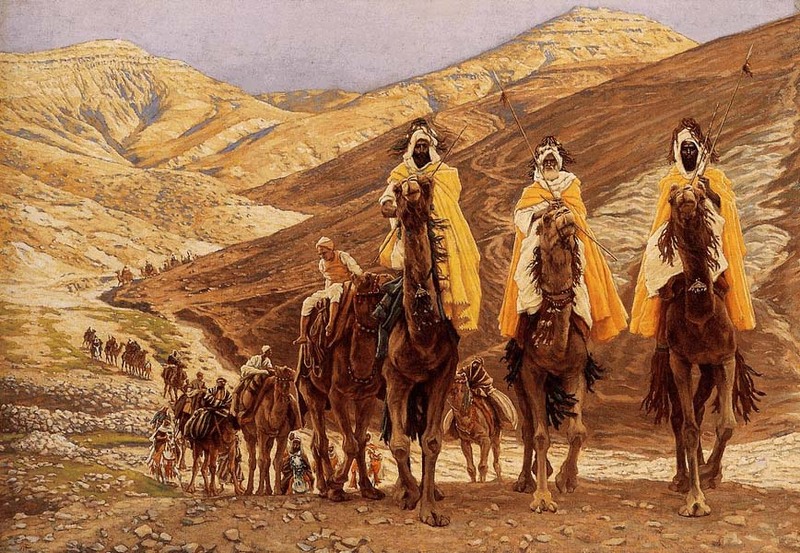 Sometime before age two, the Magi (or wise men) from the East came to visit Jesus. 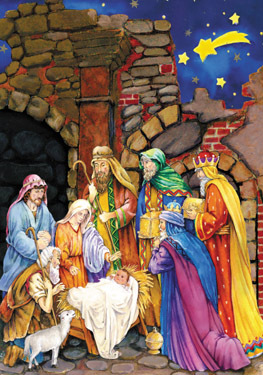 We know that it wasn't the night he was born since he was born in a manger (where the shepherds visited) and the Bible records that by the time the Magi visited Jesus, the family had moved from the manger to a house. The word used to describe Jesus in Greek is "daidion" which is a young child and not a baby, which would have been the word, "brephos," so there was definitely a time lapse involved. King Herod had earlier inquired from the Magi when they first started following the star and when he realized that they had departed the country without returning to him, he ordered the killing of all the young boys aged two and under in the town of Bethlehem, so we can assume that Herod believed that Jesus would have been two or younger. Joseph had been warned by an angel that Herod was going to try and kill the baby, so the family fled ahead of the baby massacre to Egypt and the family lived there until Herod died. 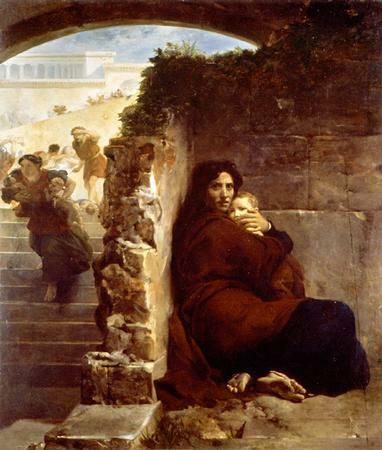 Returning to Israel (when Jesus was a young child) after Herod's death, Joseph learned that Herod's son was ruling in his father's place, so the family settled away from Jerusalem back in Nazareth where they thought they would be more safe. 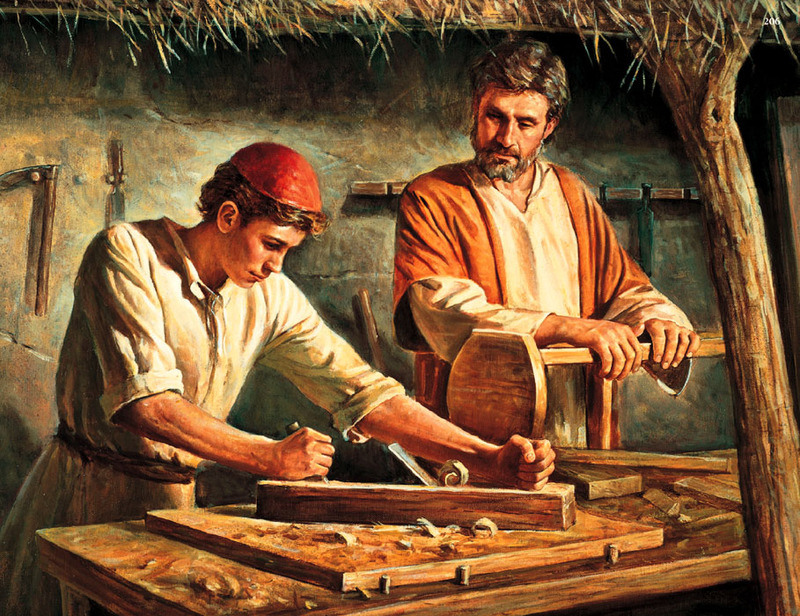 Jesus lived a pretty normal life in Nazareth, the son of a carpenter, probably learning the carpentry trade. At age 12, there is an account of his family taking a trip to Jerusalem. When it was time to go home, Joseph and Mary assumed he was traveling back with extended family, but when they couldn't find him among them, they returned somewhat panicked to Jerusalem and found him three days later in the Jewish Temple discussing theology with the elders. There is a period of time in Jesus' life, from age 12 to age 30, so 18 years time, sometimes called the "lost years" or "missing years." Most people don't realize that apart from his birth, almost everything Jesus is known for occurred between age 30 and 33. 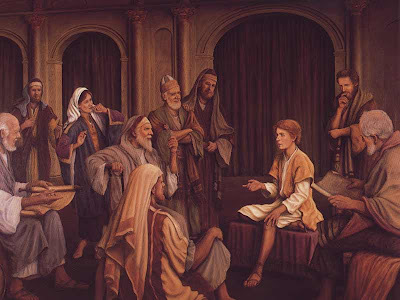 The Bible doesn't tell us what Jesus was doing between age 12 and age 30, but we can assume that they were pretty ordinary considering that after Jesus had started his ministry (between 30 and 33) he returned to Nazareth where the people were wondering where the local boy they knew had acquired the ability to perform miracles and teach so well. 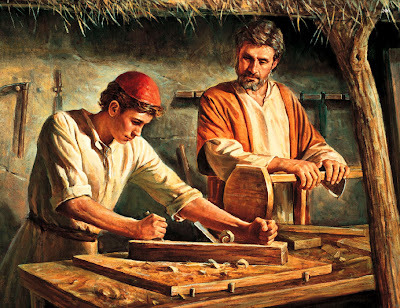 They said, "Isn't this the carpenter's son? Isn't his mother Mary, and his brothers James, Joseph, Simon, and Judas? And aren't all his sisters with us? Where did he get all these things?" Their reaction leads to a few natural assumptions on my part. 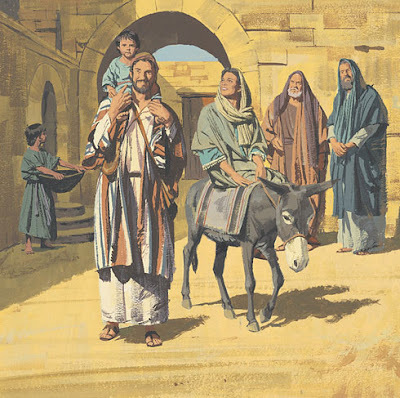 First of all, it appears from several places that Joseph, the father, was dead by the time Jesus was 30 and before he died, Joseph and Mary had other children (at least four other boys and at a minimum of two girls), Jesus being the firstborn of Mary. Since he had spent the greater portion of his youth until age 30 just hanging out in Nazareth, he was known to many as Jesus the Nazarene. Roger's last question, "Or did I miss something along the way?" is a pretty natural one. Because Jesus is such an important figure in world history, it's pretty normal for people to want to have more information on his life. There were four major books in the Bible written about Jesus' life (Matthew, Mark, Luke, John). Within a few hundred years, there were several fictional accounts written about Jesus by a group called the Gnostics. Christianity has from its earliest day been open to everyone, but the Gnostics were into hidden knowledge or secret learning and creating some pretty wild stories about Jesus doing miracles as a kid fit their belief system better than the generally known account of Jesus. Sometime in the future I'll have to talk about miracles, because that seems to be a big deal for some people, but miracles in the Bible seem to happen mostly around the times that new teaching is being revealed and then they seem to be less common at other times. It seems as though Jesus may have performed no miracles for the first 30 years of his life and then performed many miracles in the three years he was actively teaching. Love the questions in the postings on the blogs. I try to read everything and will respond as I have time. I really wish there were a better way to discuss ideas amongst posters on this blog. As a teacher I really enjoy the teaching learning process. I hope open and interesting thoughts keep coming. Thanks, Roger. I have nothing to add to your wonderful post except, "Thanks for the lesson, Nate". I imagine that, since there were a lot of ‘fake-messiahs’ going around, it was important to accentuate that Jesus was the real deal. So therefore a lot of attention was paid to describe the circumstances of his birth. Although I am a Catholic I guess there is nothing wrong with some good old pagan traditions, like singing about some guy riding through the sky while sitting around a tree in your living room. 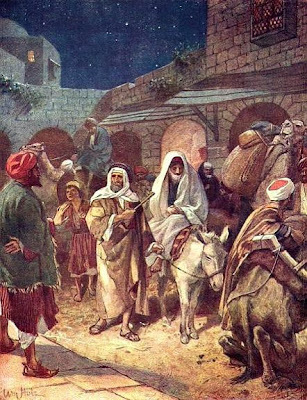 Have you read or heard about "The Revelation of the Magi"? It's a good book. Ranks right up there with the Nag Hammadi Scriptures. Thanks everyone for their nice comments. Linda and Rob, syncretism is the term to describe the blending of contrary religious beliefs. The Roman Catholic church looks very different in various corners of the planet because of this historic practice. Mathan, I did hear about the Revelation of the Magi, although I don't know if I'd put it on par with the impact of the Nag Hammadi find. Every few years a new Gnostic text is uncovered and it causes a minor stir among the tabloids as a "forgotten" scripture. Really there were lots of Gnostic writings and it's not surprising that many keep coming forward. If I recall, this one came out of the Vatican Library. I'll bet we see some more finds coming out of Central Asia and China over the next few years if Nestorians hid some things. Of course some early mainstream Christian writings would be fun to find also (perhaps a first or third letter of Paul to the Corinthians or something like that). About halfway through The Revelation of the Magi. I wonder how much Greek influence it had because chapter 5 is very misogynistic. That's too bad. That and the treatment of others (homosexuals, Jews, etc.) is what I find most unpleasant about modern Christianity. Whatever. Thanks for the website, and I hope you (all) have a Happy New Year. "It was in 1894 that news first reached the Western world of Buddhist manuscripts existing in Tibet indicating that the "lost years" of Jesus' youth had been spent in India. The alleged discoverer was Nicholas Notovitch, Russian journalist and war correspondent, who journeyed through Kashmir and Ladakh and then wrote a book about his findings, including a translation into French of the verses in Tibetan about Isa (or Issa) existing in the library of Himis monastery near Leh." Abhedananda wrote his book containing their travelogue and a fresh version of the Isa verses in stages, with the help of an assistant and a later editor; in 1987 it was finally translated into English." "According to Abhedananda, in India Jesus likely obtained the name Isa or Issa from "Isha," which means Lord in Sanskrit. Other "visitors to Himis monastery unexpectedly learned that a set of the Isa verses was located there, and Elizabeth Clare Prophet has made known three of these cases. One such visitor was Elizabeth Caspari, who in 1939 made the journey through that region in the company of a Mrs. Clarence Gasque. They were told by a monk in charge of the Himis library that "These books say your Jesus was here!" Madame Caspari later established the first Montessori school in the U.S.
Another visitor was the late Edward F. Noack, a lover of the high country of the Himalayas, who with his wife visited Himis monastery in the late 1970s. A monk there told him that "There are manuscripts in our library that describe the journey of Jesus to the East." A third visitor to the area who obtained information on this subject was Robert Ravicz, once professor of anthropology at California State University at Northridge. While at Himis in 1975 he learned of the "lost years" Jesus-in-India tradition from an eminent Ladakhi physician. It appears that word of the existence at Himis of these one or two manuscripts about Isa's "lost years" has very occasionally been leaked to Western visitors to the region, but only when the lama or monk involved felt the visitor was open minded or receptive and not inclined to take any threatening action against the monastery. If so, it is reasonable to expect that any future attempts by investigators to acquire or read the manuscripts in question at Himis or Marbour monastery will fail if the relevant lama suspects that the investigator or his sponsor in any way holds a non-ecumenical or militantly Christian attitude. "It was in 1894 that news first reached the Western world of Buddhist manuscripts existing in Tibet indicating that the "lost years" of Jesus' youth had been spent in India. Nicholas Notovitch, Russian journalist and war correspondent, journeyed through Kashmir and Ladakh and then wrote a book about his findings, including a translation into French of the verses in Tibetan about Isa (or Issa)." Years later, Swami Abhedananda, a [Hindu] monk "learned of Notovitch's find and [traveled] to Himis monastery in 1922... They persuaded a lama to show them a manuscript, which he read to Abhedananda and his interpreter, who then translated them into Bengali. The Himis manuscript was in Tibetan; the original was said to have been written in Pali and to exist in the monastery of Marbour near Lhasa, all of which confirms what Notovitch had learned. First the article is written from the view point of a white european descendant, however as a native of the middle east (where Jesus is from), I can attest it is VERY common to refer to any blood relation (cousin, step siblings) as brothers and sisters, even till this date, so it is really a stretch to assume that the "brothers" and "sisters" referred to are actually Jesus's blood siblings because no where does it state that they are blood siblings sharing both sets of parents. Secondly, and this is where we run into the problem of modern day christians who are off shoots of various forms of protestants. To truly understand scripture from the Bible, you have to go back to the time when the canon was put together, in the 4th century and go back to the council of Nicea and ask, what was the understanding and teaching of the early church about JEsus's childhood, parents, and siblings. And to do that, you need to look at the church that was in existence then, that is still in existence now, and that is the Catholic Church and the Orthodox church. Both of these churches trace their origins to Jesus Christ himself, and for a good 35o years, christians had their faith without the bible in its current form, and the teaching then was very clear that JEsus has no blood siblings of his own. So what about reference to "sisters" ? Well, the explanation for this is that Joseph (who died by the time JEsus's public ministry began) - was actually a much older man, who took MAry (who was much younger) for his wife, after his wife passed away. Sacred Tradition holds that he did so because he had a family of his own, and he needed a mother for his kids. And so, Mary was to be a mother to his kids, except that God had other plans - Mary was to bear a son,Jesus, God incarnate. Joseph knew that Mary was the tabernacle and the ark of the covenant - because she bore the word incarnate - and if you want to understand, what that means I refer you to the old testament and the rules of moses concerning the ark of the covenant and the word of God. That's another lecture. Coming back to Mary, and the law of Moses, Joseph, a devout Jew (we know that because of the turtle dove offering and the trip from Nazareth to Jerusalem - again to understand what that means I refer you to a journey on foot betwen those cities) would have been forbidden from any relationship with Mary and this Jesus was the only Child that MAry bore. So - sorry to disappoint you - but those siblings referred to aren't MAry's own kids or Jesus real brothers or sisters. As for Christmas - again you are wrong - the church has traditionally ALWAYS celebrated the Feast of the Epiphanny (JAn 6), which is still a holy day of obligation - whereas Christmas is not a holy day of obligation - but if you count the days between Christmas and Epiphany - yes, you get the 12 days of Christmas, and hence the CArol. So is the day of Christmas important ? YEs, because it represents one of the darkest days of the year, but it was not saturnalia that the church was trying to obfuscate as much as the importance of Jesus who to us CAtholics is referred to as the light of the world - was born on the darkest day - so in esssence, DEc 25, is a day of hope, of light in the darkness. You may now feel free to junk your theory of Saturnalia - yes, the time matches, but for very completely different reasons. The sad part of this article though demonstrates how misguided those who are not truly Catholic/ Orthodox are, about the understanding of the catholic church. Oh. btw, judging by "linda's" comment, it isn't guarantee that folks who call themselvs practising catholics are that much more knowledgeable either. 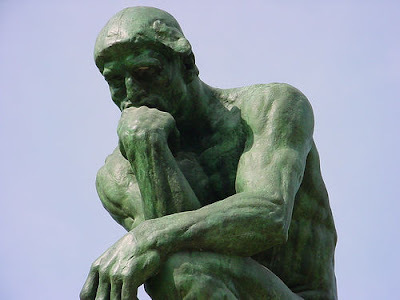 And is it true that the first Pope (Apostle Peter) was married and had a wife? Did anyone see this site which has just released a series of CDs called "The Secret Autobiography of Jesus the Christ" and Jesus’ Lost Years not listed in the Bible? The article is very necessary. Straight to the point. Yesterday the "swallow" your articles on the site, they are wonderful. An amazing book called "Lamb" by Christopher Moore is a fictional account of the lost years of Jesus as told by Biff, his childhood pal. Its a hilarious book. And very well researched and written. I recommend all of Moore's books to anyone in need of a good laugh. The belief that the Roman Catholic Church chose December 25 for Christmas because of a pagan feast day is a misconception. The Roman Catholic Church chose December 25 to celebrate the birth of Jesus because in third century Rome the Catholics believed that March 25 was the date of Jesus' crucifixion. Catholics then believed that it would be fitting that the life of Jesus would exist in a perfect year: meaning Jesus would have been conceived the same day he died; meaning he would be born 9 months later: December 25. Roman Catholics still celebrate the Feast of the Annunciation (conception of Jesus) on March 25th.